During December of each year we’re reminded in a variety of ways to be of good cheer. Depending on circumstances going on around us and in the world, we can sometimes find this to be a bit challenging. The “Cheers!” Mandala asks that rather than focus on the outside world, we take a look within ourselves, acknowledging ALL that we accomplished this year…both the obvious AND the subtle. Search high and low, allowing ourselves to be the observers of our accomplishments (versus the judge or critic) and on all levels: physical, mental, emotional, and spiritual. If a friend asked us to do this for us we would be quite thorough and cheer on each accomplishment. Take that same honest and kindhearted approach with ourselves. And celebrate ALL that we achieved. Feel free to use the petals in the mandala as placeholders for these accomplishments. What color(s) would each accomplishment be? Would there be texture? Does it want a doodle? At the same time, use the center ‘circles’ as placeholders for the seeds (new ideas, projects, behaviors, habits, thoughts, etc.) we want to plant throughout the new year. What would we like to accomplish? What behaviors do we want to change? How do we want to grow in 2015? 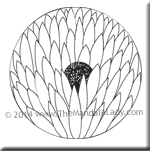 Be sure to download Section 12 of the 2014 Mandala of the Year.